Yes, I’m smiling. I just walked around the glass-bottom lookout. “Come on, you can do it,” coaxes the woman in uniform when she sees me falter. 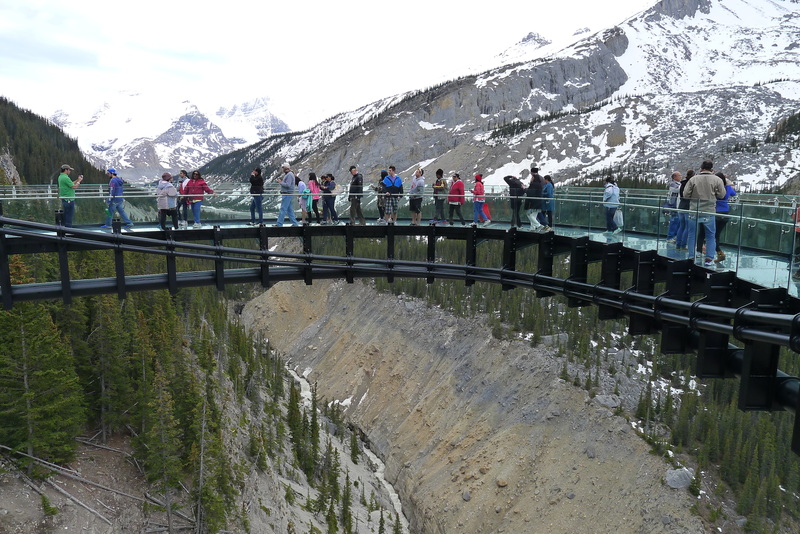 She is standing two feet away and 280 m (918 ft) above the Sunwapta Valley, on the glass-floored platform of the newly-opened Glacier Skywalk in Alberta’s Rocky Mountains. 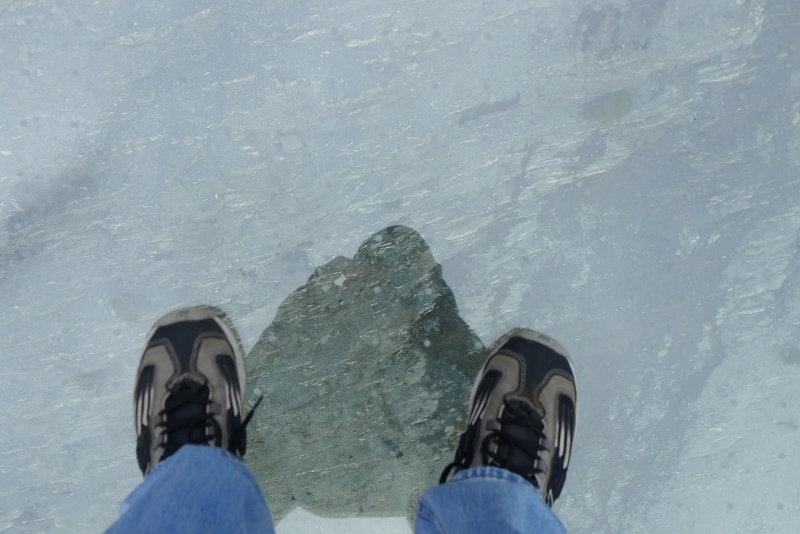 I stand frozen, like the mighty Athabasca Glacier, at the edge of the steel walkway that leads to the glass portion of the horseshoe-shaped lookout. “I can’t look down,” I explain weakly, as other braver men, women and children circumvent my husband and me to step out into space and take in the sweeping beauty of the mountain-fed glaciers and glacier-carved valleys formed thousands of years ago. “It’s cloudy today and the sky is reflected in the glass, so you won’t get a clear view beneath your feet. Just look out,” she adds encouragingly. My husband, who has already walked around the lookout that extends 30 m (100 ft) out over the canyon, knows my stomach drops below my centre of gravity when the ground beside me suddenly drops away. I recall approaching the indoor glass floor on the observation deck of the CN Tower in Toronto, the tallest building in the world until 2009, on my hands and knees. But I was much braver than those who inched up on their bellies to peer down the 342 m (1,122 ft) drop to the street below. I step forward, thankful we’re here in May, two weeks after the opening and before the summer tourist season. We easily, and quickly, navigate around the people pausing by the railing to ponder and pose. 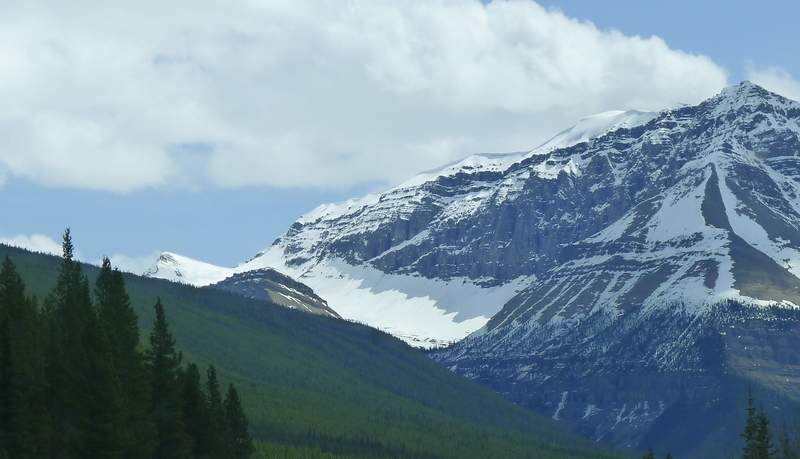 We’ve come from Jasper, along the Icefields Parkway (Hwy 93), considered one of the most scenic drives in the world. The alpine views in the Columbia Icefield are spectacular, as we motor past 100 ft waterfalls, rugged canyon walls, snow-capped mountain peaks and the rushing Athabasca River. The Columbia Icefield is the largest frozen ice mass south of the Arctic Circle and feeds six major glaciers. The famous Athabasca Glacier is six km long and one km wide. This well-travelled highway – and I mean high-way – links Jasper National Park to Banff National Park. Up here, above the tree-line at 2,088 m (6,850 ft), we are winding along the crest of the Continental Divide of North America, where the mountain water flows to the Arctic, Atlantic and Pacific oceans. Approaching the Columbia Icefield Glacier Discovery Centre, (about 1 hour south of Jasper and 2.5 hours north of Banff), I could see how much the Athabasca Glacier has retreated. It used to come down to meet the highway, but is now reported to have receded 1.5 kms (.93 mi) since 1890. A free, six-minute shuttle bus gets you to the skywalk. Designed in 2011, the skywalk underwent three years of environmental assessment studies and wildlife impact studies before opening in May. The architecturally-acclaimed structure is built into the bedrock with iron oxidizing steel, glass and wood, and blends discretely into the rocky landscape. My brochure says it is free of paint and other toxins and it leaves a near zero footprint. On the bus back, I chat with a young woman who had been to the Grand Canyon South Rim in Arizona. She thought the horseshoe lookouts were about the same size. The Grand Canyon Skywalk extends 21 m (70 ft) from the canyon rim, while the Glacier Skywalk extends 30 m (100 ft) over the canyon and rushing river below. But, the glass observation platform at the Grand Canyon Skywalk is 4,000 ft. (1,219 m) above the canyon floor. I was pleased to discover that the solid steel fences along the inside cliff-edge walkway actually shields you from inadvertently catching a glimpse of the canyon below as you make your way to the lookout. So you can stop along the fully-accessible path to read the interpretive exhibits, describing the local ecosystem and wildlife, and find a few safe alcoves to do your posing and pondering. And if you still haven’t mustered the courage when you find yourself at the glass floor, look to the sky for guidance. Is it cloudy? The drive and scenery alone is spectacular in the Columbia Icefields, even if you never walk the skywalk.